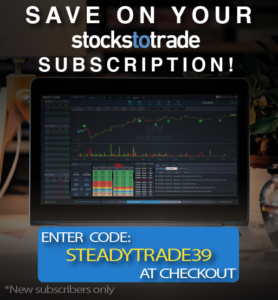 At the Steady Trade Podcast, we believe that learning the stories behind successful traders can prove inspiring to those who are new to the market. 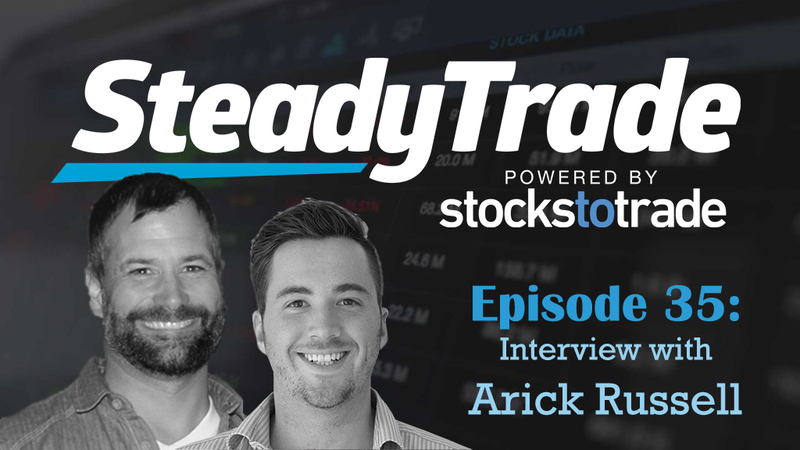 In this episode, hosts Tim Bohen and Stephen Johnson reveal the secrets to trader Arick Russell’s success in a comprehensive interview. Having attained trading stardom via his YouTube videos, Arick boasts a truly unique story wherein he began trading out of a truck while on his breaks working a full-time job, ultimately going on to make first thousands, then hundreds of thousands of dollars. Listen and learn! Arick’s beginnings as a trader about five years ago weren’t necessarily auspicious. Curious about stocks, he began to buy randomly and lost a lot of money. However, instead of quitting, he decided to backtrack and actually learn the rules of the game. For months, he invested in his education; it was during this time that he discovered Tim Sykes and many other informational resources. Eventually, he began to trade again. Having a full-time job, his time was limited, but he caught time where he could, often enough via hotspot in his truck during work breaks. He began to discover what his strengths were as a trader. After a start with penny stocks, he eventually wanted to diversify with larger investments, much like Stephen’s journey in last week’s episode, Stephen Trades Some Big Boy Stocks. In telling his story, you’ll learn the benefits of diversification and how and why you can benefit by gaining a broader overall knowledge of the market. After all, you can’t short penny stocks all the time! By continually improving his methods, Arick was eventually able to go full time as a trader this past year. Arick’s rules for trading success. Figure out your own trading style. In the episode, Arick details some of his favorite setups, including his YouTube-famous red to green and green to red trades. As he found, these trades had plenty of power and worked better than breakout patterns. However, this doesn’t mean that these are the right trades for everyone. He details how determining your own trading style is key to finding success. Adjust your expectations. Realistic goals are so important for long-lasting success. Sure, it would be great to profit $1500 to $3000 a day, but as a new trader, setting goals like this will likely discourage you and make you want to quit. Arick offers some helpful tips for setting realistic goals and how they can help you stay motivated. Refine your methods. Don’t be a jack of all trades, a master of none. Realize what is working for you, and focus on those setups. When your attention is too scattered, you can’t improve. Arick offers specific tips for how to figure out how to figure out what is working for you and how to continue to refine your technique. Have a plan. Emotions can get in the way of trades. This is true for veteran traders as well as newbies. This is not necessarily a good thing; recognizing this, Arick now tries to trade more “like a machine”. He has a trading plan to ensure that a trade meets his criteria and helps him make the best decisions. You’ll pick up some helpful tips on how to stick to your own plans, too. Know why and how you’re making money. Believe it or not, Arick believes that he learns more from his losing trades than the winning ones. In the episode, he discusses how to learn from your mistakes and determine what is actually making you money so that you can focus on growth. As the episode closes, Arick offers words of advice for new traders and addresses some reader inquiries from social media as well. Ultimately, he believes that traders should focus on slow but steady growth, and focus on specific goals. For Arick, those goals are clear. He doesn’t necessarily want to work less, but to enjoy life more. For him, it’s vital to think outside of the box and discover what really works for his own career. Trading has helped him do that–perhaps you, too? Do you have an inquiry about this episode or a past episode? Be sure to visit the “submit your audio” portion of the website to submit your question. You might just be featured in an upcoming episode! I haven’t started trading yet but I’ve been watching your YouTube videos and podcasts as well as all the videos posted from Tim Sykes Tim Grattani and Steven Dux and i’m already learning a lot and will be signing up soon to MMP and then STT I have a long road ahead of me on my journey to become a successful day trader. i hear all the time people saying accept and learn from your losses but what are the questions i should ask myself after a loss? If you did, then accept that losses are part of trading. If you DIDNT, work on your discipline. another great episode, i watched quite a few of Arriks videos on YouTube and he does tend to use a lot of indicators, FIB, VWAP & Parabolic along with drawing trend lines and triangles, which he seems very good at. The planning aspects he uses seem the same but he’s method is different in many ways from the way you teach. i’ve heard you use the KISS principle and wondered if you thought the indicators unnecessary or were over complicating trading for a beginner. I do use a lot of indicators, but you actually nail my point. I think it is VERY easy for new traders to suffer from “indicator overload” until you have a firm read on charts and price action along with volume, I say keep the indicators to a minimum. Then add them slowly and test. Hey Tim and Steven, I just want to thank y’all for another great episode of the steady trade podcast. I was wondering if Aric Russell provided any contact information via Twitter or profit.ly etc.? I would like to follow his progress. Thanks again for the podcast, great show! another great episode. I follow the podcast with interest and I found it enjoyable and educative. I appreciate your work to get this awesome content to us. One little critic for the betterment (imo) of this program the I like so much: it would be nice to have the guest speak a little more. I strongly feel that there are too many interruptions and that the guest do not have the chance to elaborate. Reminded me the interview with Dux. I agree Dave, it is something I’m working on! Thanks for the constructive criticism I do appreciate it! and I do appreciate the effort you, Stephen and your team do. Many thanks for the amazing program!! Love learning from other people, slow and steady progress being made because I too work full time. I really enjoy all of this, getting more confidence by the day, actually to the point where I am cussing at my computer! Keep up the good work love the different topics, keeps it real. Very inspirational interview. Great to see the success that Arick has experienced. Hard work and staying with your plan pays off, you can’t give up on it. There is hope for me yet!! I agree, Arick trading from attics and trucks was very inspirational! Another VERY helpful podcast! Loved his comments on constantly/often wanting to quit and keeping your P&L hidden. Thanks!!!! Thanks for being a repeat listener Diane!